World Hyundai in the Matteson Auto Mall is having a two-week Columbus Day Sale starting on Monday, October 5th through Saturday, October 17th! Take advantage of end-of-the-summer savings and model year end events, all coinciding with Columbus Day this year! We’ve got great offers on the 2015 Hyundai Sonata as we make room for incoming 2016 Hyundai Sonata models. Also, great financing offers available on the 2015 Hyundai Sonata including 0% APR for 75 months and more! 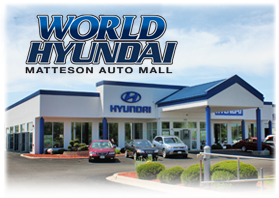 Located in the back of the Matteson Auto Mall, World Hyundai is one of the top selling Hyundai dealers in the Chicago area and has continually been ranked among the best selling Sonata dealers in the midwest. In addition to the popular Sonata, our staff is happy to assist you if you are interested in looking at the new 2016 Hyundai Elantra, 2016 Hyundai Genesis and more. We’ve also got popular Santa Fe models available for you and your family! For more information about our World Hyundai Columbus Day Sale in Chicago, contact us directly at (888) 817-5868.